Karen please email me at sberkley51 at gmail dot com to claim your prize. So... I thought that it would be fun to create a sad/spilt coffee cup. YNS Java Geek, YNS Coffee Rings, YNSJava Geek Die Set, Baking Buddies YNS, File Tab Die YNS are all available at One Crazy Stamper! I used a newspaper style card stock which I think is perfect for the coffee rings background stamps. Some heart gems for total coffee love, fine twine, sewing stitches and a glossy accents coffee puddle too! Thanks for peeking and happy Friday! Happy Thursday OCS Fans! We're one day closer to Fri-YAY and it's almost the end of January already - wow! Some of you may have noticed a few changes in the posting schedule here at OCS. I thought I should tell you a bit about myself. I have always done some kind of crafting and took up scrapbooking about 13 years ago. Anyway, I will be posting and hopefully providing some inspiration for you here on Thursdays. I am honoured to be part of the super talented group of designers here at OCS. Now enough about me - on to this weeks post! 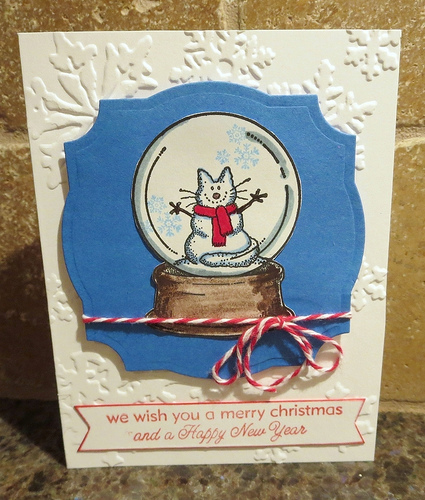 Today I am sharing a card using an older stamp from High Hopes called Sitting Kitty with Posey (P146). 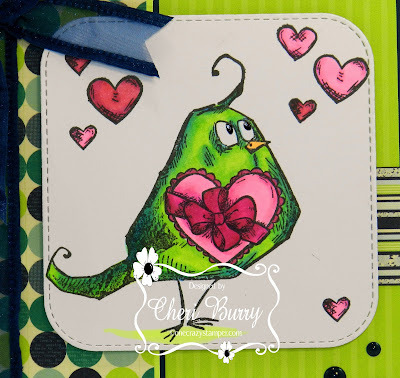 This super cute stamp is coloured with alcohol markers, cut out with a Spellbinders circle die, and "stitched" around the border. I mounted my stamp onto a doily from my stash, added my patterned paper and my "hello". My favourite - gumdrops, finish off my card. 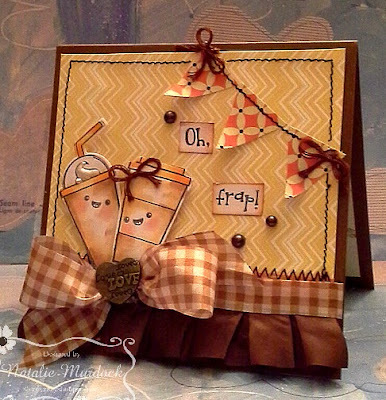 You have a few more days to play along in our challenge this month - it's Anything Goes (except digital stamps). Follow this link for all the details and to post your project. This is the last post for January so that means it's the last Crazy Bird in my Crazy Bird series for January using the Tim Holtz Bird Crazy stamp set. 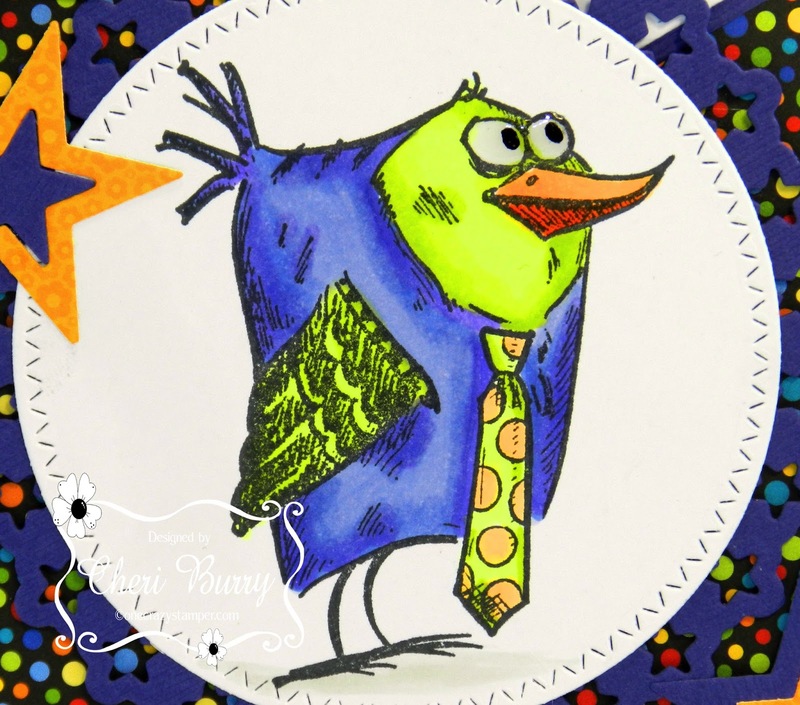 I hope you've enjoyed my take on these fun "crazy birds"! 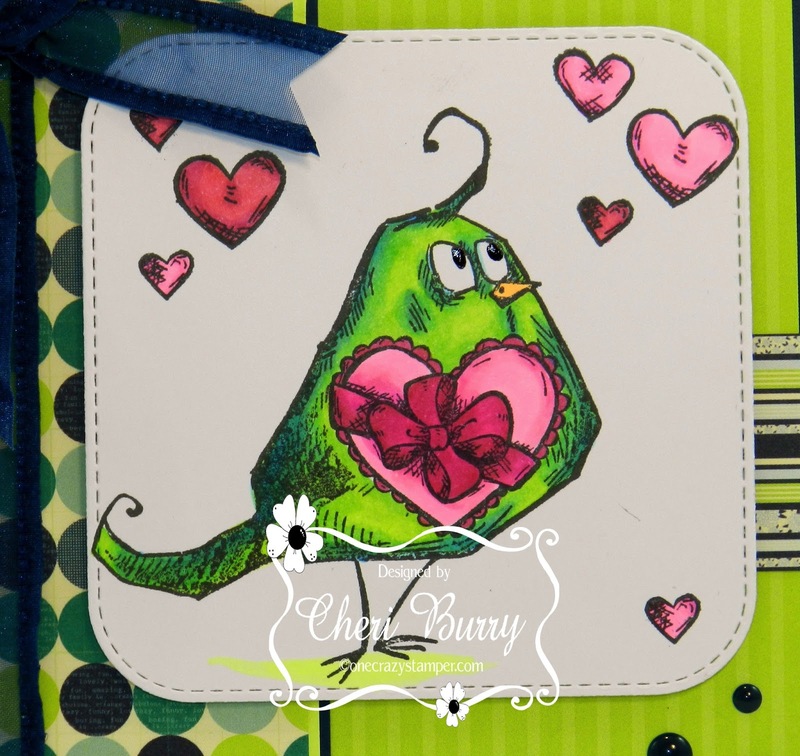 For my bird today I made him into a Valentine card card using the heart from the Crazy Accessories stamp set. I stuck with the same Copic marker theme all month, using some of the Copic Sketch Fluorescent markers. The bright paper is from the Bo Bunny Family Is 6x6 collection that I've had for awhile. There is no doubt that the winter here in Ontario is either mild with melting snow or snowing and bitter cold temperatures. Either way, it is a good time for Hot Chocolate. 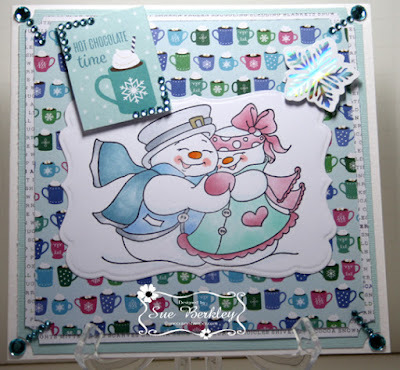 For my post today, I have used this adorable stamp called Snowy Couple from the latest release of High Hopes Rubber Stamps. The sentiment is from the Winter Wonderland paper pack from Pebbles. There is still time to enter this month's challenge, "Anything Goes". For any supplies that you might need or want, check out both the brick and mortar as well as the online store OCS. Lora does have some amazing products and new products that will soon start arriving. 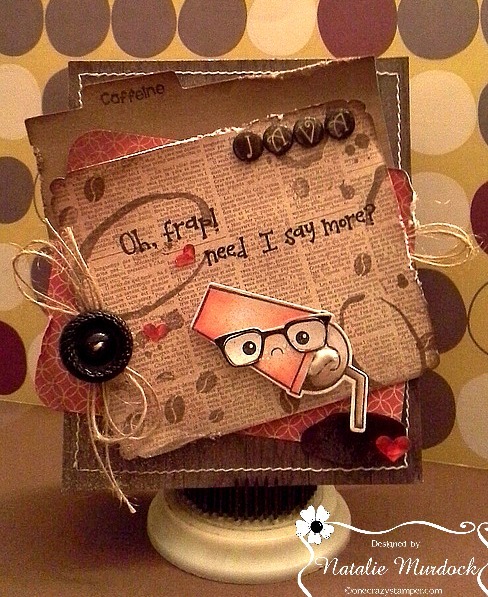 Great challenge still happening here at One Crazy Stamper and we love seeing your creations. 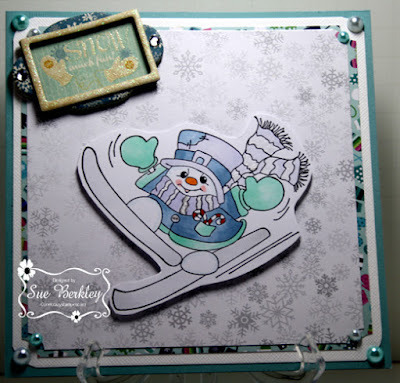 My card today is from the fun High Hopes Rubber stamps called Snowy Holding Sign. I stamped my image using Memento Ink on Xpressit Copic Blending card stock, and I colored using my Copic Markers and added some liquid applique, love that stuff. 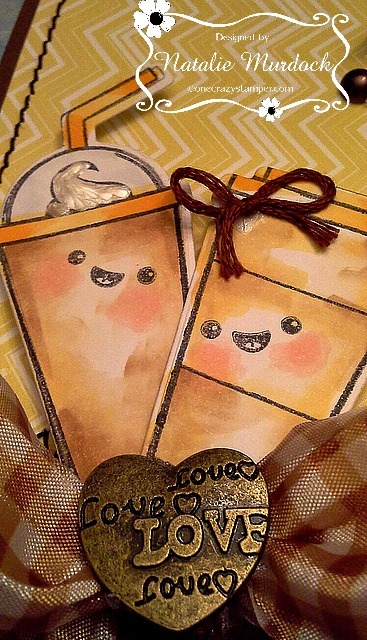 I also popped up the sentiment using foam tape. Not often I do make a one layer card, and it was fun. 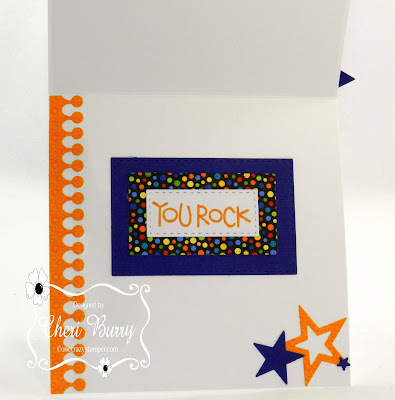 Thanks for stopping here, and play along with the fabulous team here at One Crazy Stamper. Don't forget to stop by Lora's store and pick up your supplies. Till next time happy crafting. 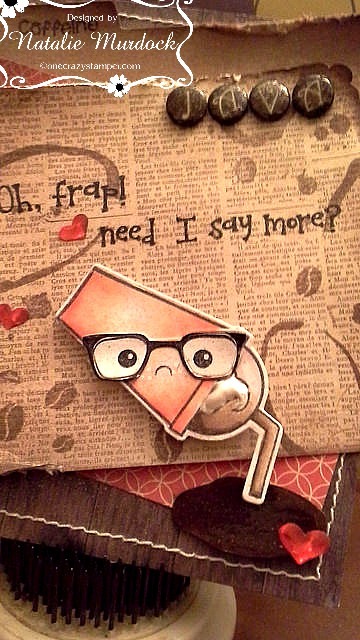 Oh Frap! 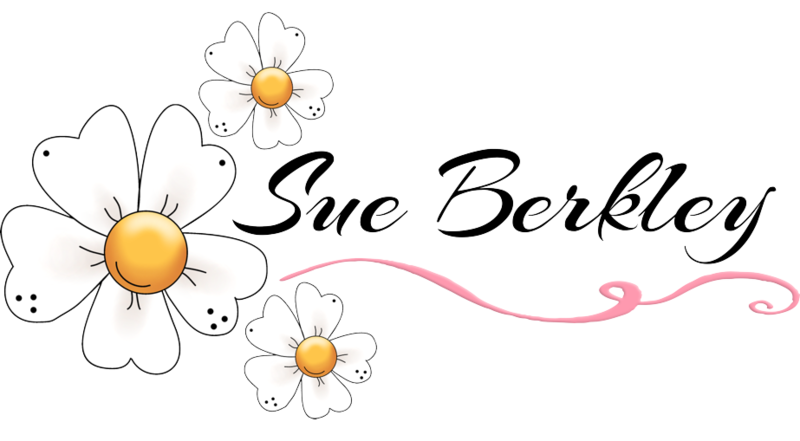 Java Geek - One Crazy Stamper! 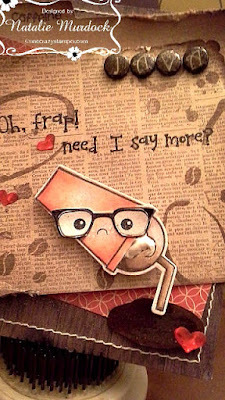 Oh Frap! Yep these two Java lovers are having fun again! Honestly I adore this sweet stamp set and have many fun scenes to create. 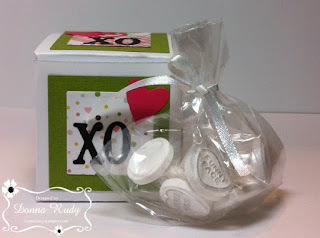 You can grab these stamp sets here at One Crazy Stamper. 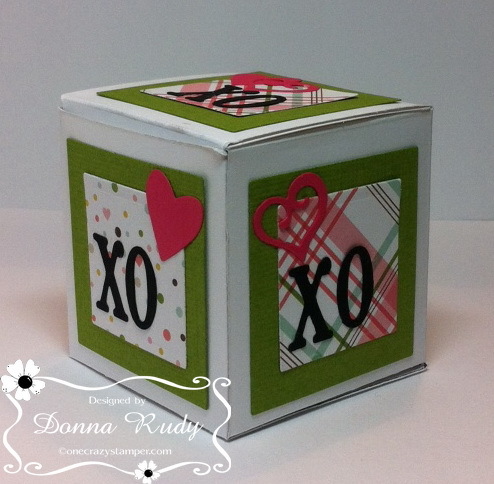 For this card I pulled out my sewing machine and used some super thick button thread for added details. The banner flags are simply hand cut triangles with tied bows at each end. 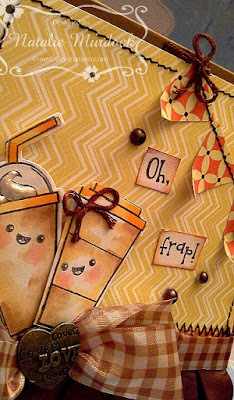 The sentiment was one piece so I cut it up to create a different look to the "Oh Frap!" which also worked better on my design. The love embellishment was a heart safety pin which I cut and hot glued in the middle of my bow. The froth on my Frap was created using Liquid Pearl Paint. Thanks so much for looking. Hope you take time to have a Java with a friend! Happy Thursday OCS Fans! It's almost Fri-YAY!! Last week I shared a card I made after challenging myself to use a stamp in a way that might not be the first thing that comes to mind - ie. rabbit = Easter. This week I challenged myself to do a card that wasn't in the "normal" colours for a specific day/event. For Valentine's Day I automatically think red. I chose to go with a pink, blue and green theme for my card featuring Bear Buddies from High Hopes Rubber Stamps and mini treat box. I coloured my image and fussy cut it and then added it to my card base. 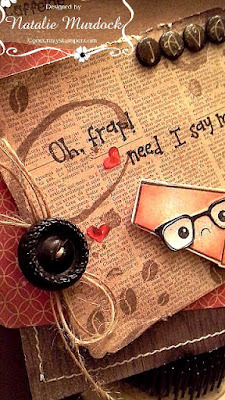 I paper pieced their boots and the bow tie is paper pieced from Joy Ride, another High Hopes stamp. The base was formed by tracing and cutting out a heart shape, adding some foam tape, sequins and clear beads inside. I added a bow to finish it off. I also wanted to make a treat box to go along with my card so I googled it and found this very cute Little Gift Box . The Sweetheart candies are a wedding favour from my brother's wedding this past summer. Don't forget to come play along in our challenge this month - it's Anything Goes (except digital stamps). Follow this link for all the details and to post your project. 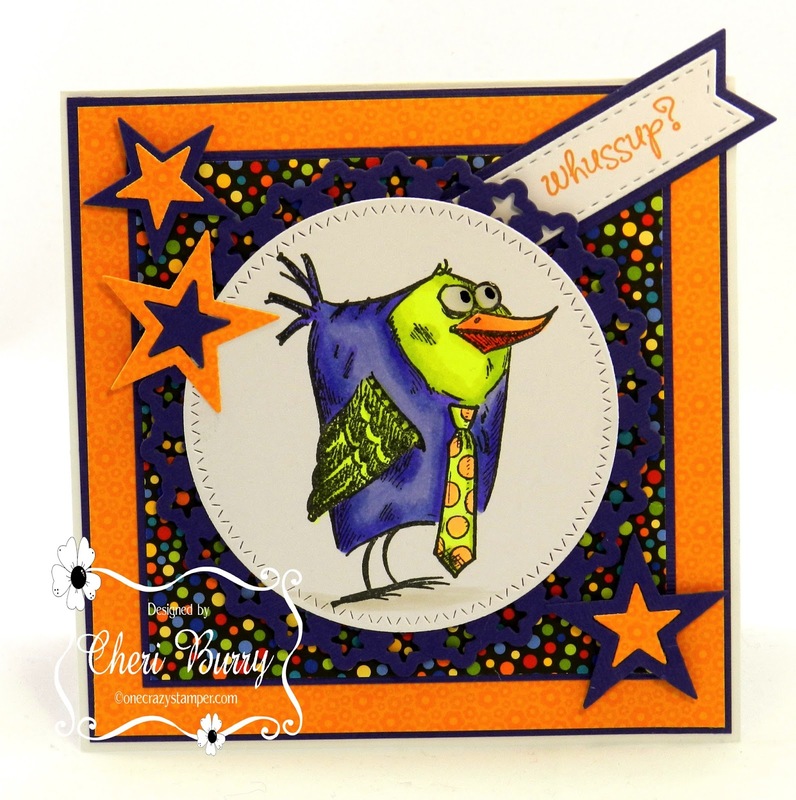 Today's post is the 4th bird in my Crazy Bird series for January! 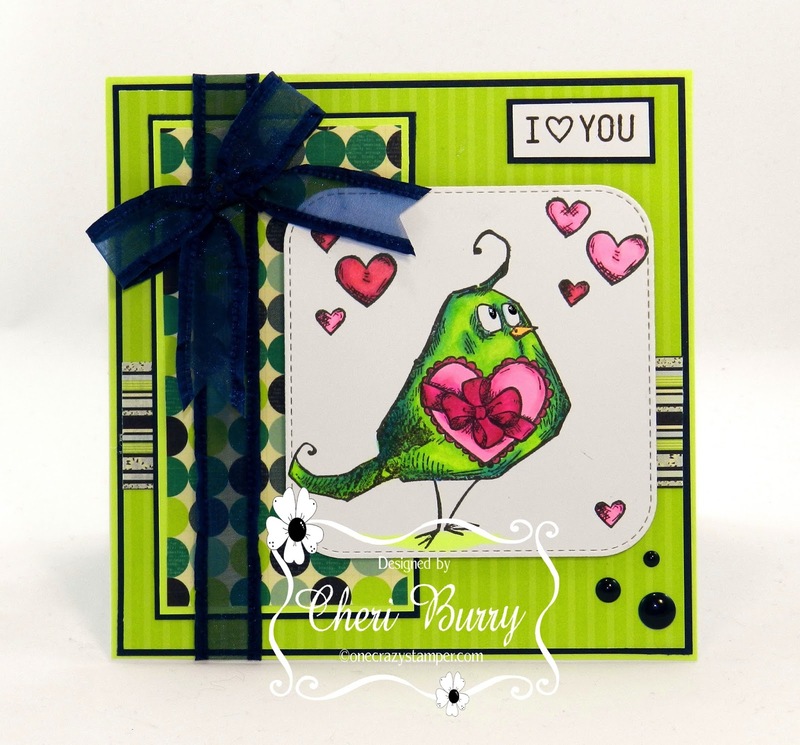 Once again I am using the Tim Holtz Bird Crazy stamp set and the Crazy Accessories stamp set. Once again I am using some of my Copic Sketch Fluorescent markers. I love how fun and vibrant they are. So of course I had to match my bright image with some fun and bright papers from my stash. I used the Spellbinders Star Circles die to layer behind my Crazy Bird. A cute little sentiment stamp and a few MFT Die-namics Stacking Stars finish off my card. Please remember to make something crafty and enter it into our January Challenge called "Anything Goes". Thanks for stopping by today! Well this month is definitely not your typical winter. One day it is raining and the snow is melting and the next day it is snowing and depending on the location there is a lot the white stuff that is great for skiing. For my post tody at OCS, I have used the Skiing Snowman from the High Hopes Rubber Stamps latest release. Do come and play along in our "Anything Goes" challenge this month. For any supplies that you might need to do your project, visit Lora's OCS store either online or in person at the brick and mortar. Java Great Day, Happy Friday !